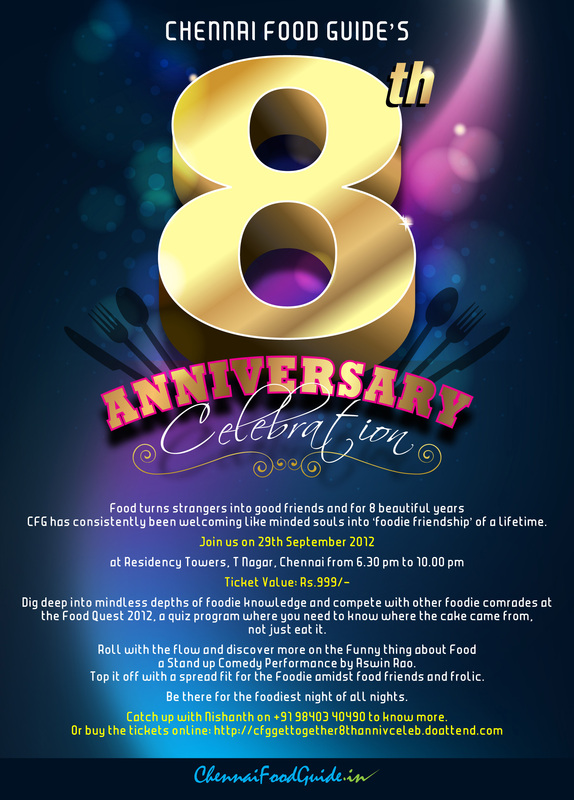 Happy Anniversary – Chennai Food Guide!! With just a week to go for Chennai Food Guide (CFG) completing 8 years, it is only apt that my blog speaks about it. Name says it all – Chennai Food Guide — a group of foodies joined together to start a group in Orkut and then in Facebook to discuss about their love – Food !! Group has been in existence including people from all over the world. We discuss food in all aspects namely restaurant reviews, where do you get this & that, recipes et al. If you think it is only about blah blah on food – No!! It also addresses grievances from customers and helps sort out issues. It is not a surprise to say that people in prominent positions and (or) owners from Restaurants / Hotels / Eat-outs are part of this group. They are also listening to us the “Foodies as Customers”. Group has also introduced regular events such as cooking workshops (on various cuisines), exclusive dining sessions etc. And the list goes on! Check out the events section in CFG FB Group to get an idea what all happens. With 7K plus members the group is now nearing completion of 8 years and it is only apt that CFG Family celebrates. That’s what the poster is all about. Get ready to win loads of prizes! You don’t have to be a foodie to join this group yet am sure you will find this group useful. See you on September 29th, 2012.